A top Hollywood publicist says the excitement in Los Angeles over Texas Democratic Senate candidate Beto O'Rourke is at a level he hasn't seen for a national liberal politician in years. Danny Deraney, a Hollywood publicist who has worked with celebrities like Justin Timberlake and Madonna, said he hasn't seen Los Angeles this excited about a national politician in years. "Barack Obama kind of swept everybody off their feet, and I think Beto has done that here, too," he said. "Here in a city that is pretty left-leaning, they see someone who is hopeful for this party, that is not the same old same old. I think people see him as someone who is refreshing." Celebrities and sports stars from LeBron James to Ellen DeGeneres to Tony Dungy to Stephen King have expressed their Beto-love. Steve Kerr, the coach of the NBA champion Golden State Warriors, wants him to run for president. And New York City donors were willing to shell out at least $250 for a recent O'Rourke fundraiser — even though the candidate only appeared via Skype. Deraney, responding Sunday to a tweet of a woman overhearing Brooklyn residents talk about making calls for O'Rourke's campaign, noted he saw an O'Rourke lawn sign in Pasadena, California. O'Rourke signs have popped up on lawns all over the country, although obviously that doesn't translate to votes in Texas. I saw a home in Pasadena with a Beto for Senate sign this week. As a showcase of his national appeal with liberals, O'Rourke raised $38 million last quarter to shatter the Senate campaign record set in 2000 by New York Republican Rick Lazio, who ran against Hillary Clinton. However, polls have begun to trend more in his opponent Sen. Ted Cruz's (R., Texas) favor as Election Day approaches. The latest RealClearPolitics average shows Cruz with a seven-point advantage. Cruz has said O'Rourke is courting out-of-state Democrats and doesn't represent Texas, which hasn't elected a Democrat to statewide office in decades. "He's pursuing the national Democratic activists in Iowa, New Hampshire—not El Paso," Cruz said last week. While O'Rourke has run as an unabashed progressive and tried to stay positive in his messaging, he went on the attack in his debate with Cruz on Tuesday, calling him "dishonest." 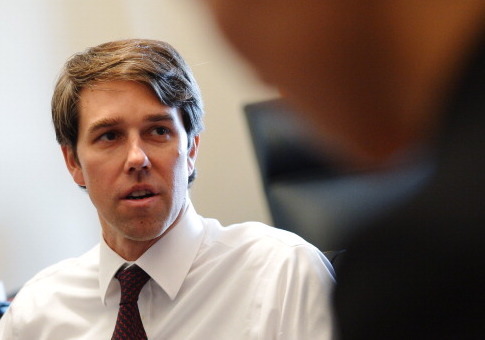 O'Rourke's run has received significant media attention, and he's even been put on polling lists for 2020 Democratic presidential candidates. Cruz compared him last month to failed Democratic gubernatorial candidate Wendy Davis, who also received national buzz for her pro-abortion fight in Texas but went on to lose by 20 points to Republican Greg Abbott. "Every two and four years, the national media starts to swoon and say there's a blue wave in Texas. Four years ago, we saw it with Wendy Davis," Cruz said. "Like Beto O'Rourke, Wendy Davis raised tens of millions of dollars and thrilled liberal Democrats in Massachusetts and New York and California." This entry was posted in Politics and tagged Beto O'Rourke, Ted Cruz. Bookmark the permalink.